Gladiators were divided into different classes according to their weapons and fighting styles. There were strict rules and protocol surrounding the fights of gladiators. However the Naumachiarii were not the normal gladiators. They fought mock sea battles which re-enacted the Roman victories over their enemies. The first Roman Gladiators, including the Naumachiarii, were prisoners of war and many were forced to fight to the death for the entertainment of the Roman spectators. The warships used by the Romans were called the Triremes, Quinqueremes and the Dromons. What type of gladiator was a Naumachiarii? What weapons and armor did they use? What was their style of combat? And what type of gladiator was matched as their opponent? - The Naumachiarii were expected to slaughter their opponents, or drown in the process. The Romans enjoyed great spectacles. The wealth of the early Roman Empire allowed for extravagant re-enactments of famous water battles (naumachiae). The first Naumachiae shows date back to the first Punic war against Carthage during the days of the Roman Republic when the Romans were enjoying new successes with their naval fleet. The first Naumachiae probably started when new ships were being built and Roman sailors and slaves trained in how to row which was watched by enthralled Roman spectators. Rowing practise was replaced with the novelty of watching actual water battles. The Italian sea, rivers and eventually lakes were used for re-enactments of sea battles. Julius Caesar originated these spectacular displays when in 46 AD he had a permanent lake built specifically for Naumachiae on the far side of the River Tiber, just outside of Rome. This artificial lake measured 1800ft long and 1200ft wide and was surrounded by marble seating for the wealthy spectators. Up to 3000 Naumachiarii were engaged in the fighting and the sea battle featured 12 Roman galleys. The Emperor Claudius was enjoyed these water battles and used the Fucine Lake for this purpose. The number of galleys involved in the Naumachiae (water battles) increased and became more elaborate and spectacular. Arenas, such as the Roman Colosseum, were built to be quickly flooded. However, the amount of space available in an arena was extremely limited compared with purpose built or natural lakes which were generally used to put on the naumachiae 'shows'. The arena at the Roman Colosseum only measured 79.35 x 47.20 meters and the depth of the water would have been only shallow. Special flat-bottomed boats, built to a smaller scale than Roman galleys were specially built for the Naumachiae and the Naumachiarii were forced to fight and drown during the water battles. The naumachiae 'shows' staged in an arena were clearly not as massive or spectacular as those staged on the lakes. The Emperor Domitian (81 AD - 96 AD) made the decision to replace the area beneath the Colosseum, with its ability to flood and drain the arena, with a series of tunnels and the Hypogeum. Less than 20 years after the Colosseum was built it became impossible for the Naumachiarii gladiators to fight in the arena - even more were slaughtered in the massive lakes. 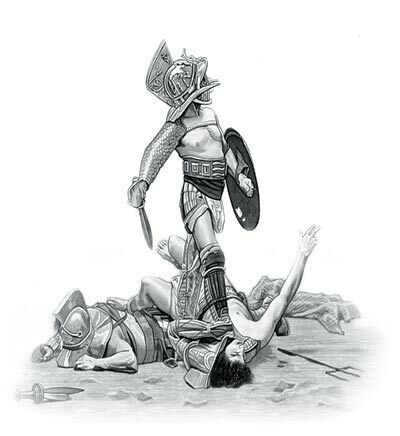 The content of this Naumachiarii category on the different types of gladiator who fought to the death in the gladiatorial combats staged in Ancient Rome provides free educational details, facts and information for reference and research for schools, colleges and homework. Refer to the Colosseum Sitemap for a comprehensive search on interesting different categories containing the history, facts and information about Ancient Rome. Interesting facts and information on this type of gladiator: their weapons, their armor and their style of combat.